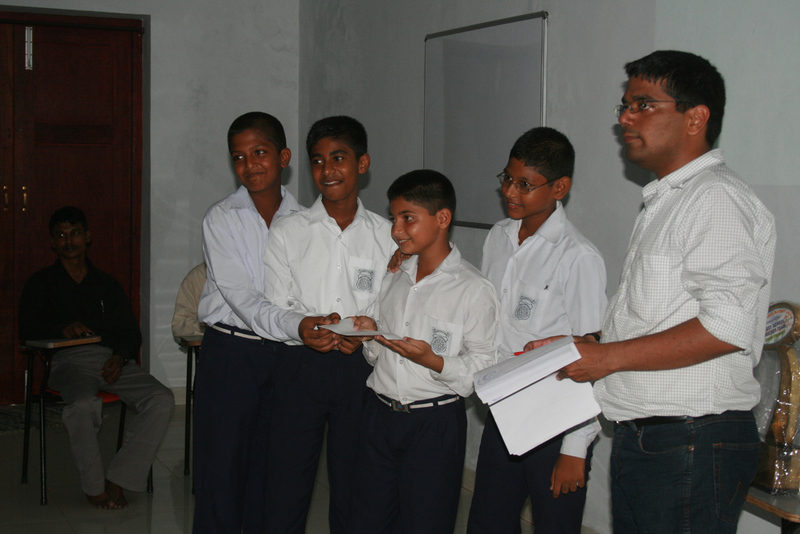 Aug 11: A packed hall with audience and 5 teams participated in the Quiz at Amalorpavam School. The audience enthusiasm was too high on this day. In beginning, when the Shashank Gupta, who was conducting the quiz, checked with audience�s knowledge of Hockey, it was surprising to see that they could name around 13 players who have played for India. This was encouragement for the OTHL team who knew that today�s audience is surely well informed. However, as the quiz progressed, the children were caught unaware of many of the questions and often �Oooooo�.� sounds were heard when the answered were told. The audience brought back all the missing life in the whole show. They were highly enthusiastic and made sure that they answered all the answers that were put to them. Team E was in control of the proceedings right from the beginning. They ended with 14 points. They were always in a comfortable position with Team B ending 2nd with 7 points. The winners and runners up won Rs. 500 and Rs. 200 respectively.